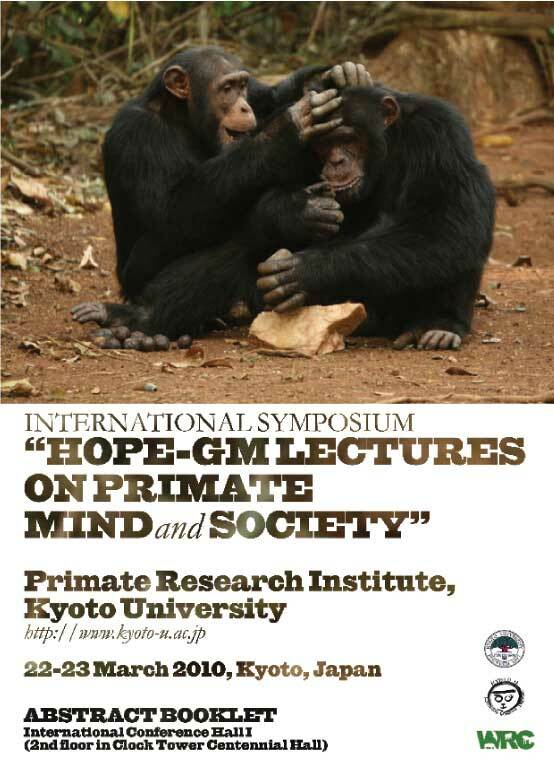 "HOPE-GM LECTURES ON PRIMATE MIND and SOCIETY"
16:40-17:40 William McGrew Fifty years of wild chimpanzee tool use: where do we stand? A series of experiments were conducted to measure event-related potentials (ERPs) in an awake chimpanzee. In the first study, ERPs to auditory stimuli were measured with reference to a welldocumented component of human studies, namely mismatch negativity (MMN). The results confirmed a MMN-like component in a chimpanzee for the first time, implying that chimpanzees and humans share cognitive and neural processing for detection of deviant stimuli. In the second study, ERPs were measured for each of the following auditory stimuli: vocal sound of subject's own name, familiar name of other group member, unfamiliar name, and non-vocal sound. Following the stimulus onset, a negative shift at approximately 500ms latency was observed, in particular with response to the subject's own name. Such specific ERP patterns suggest that a chimpanzee processes her name differently from other sounds. The last study revealed brain activities in response to various kinds of pictures which are assumed to differ in affective valances for a subject. Following the stimulus onset, ERPs differentiated at approximately 250 ms with regard to stimulus type, indicating that the chimpanzee starts to process affective valance from an early stage. Wild chimpanzees are known to live in a "fission-fusion" society. The members of a unit-group do not always travel together but often split into temporary "parties" of various size and composition. They use long-distance vocalizations such as pant-hoots to communicate with others out of sight. Captive chimpanzees cannot travel freely in a forest, but chimpanzees at Primate Research Institute, Kyoto University, also show similar patterns of fission-fusion grouping in their daily life. They can walk around some indoor rooms and outdoor enclosures, and some of them also travel around several experimental rooms. Members of the party, that share one enclosure or room, are flexible. The purpose of this study is to clarify how they use vocalizations to communicate with others out of sight. To this aim, I recorded the vocal behaviors of chimpanzees in outdoor enclosures, and examined how chimpanzees in the experimental rooms reacted to these vocalizations. I used video-recorded data collected in the experimental rooms for these analyses. I will show preliminary results in the presentation. We investigated the effects of cognitive experiments on chimpanzee activity budgets through direct comparisons of wild and captive individuals. One goal of captive management is to ensure that the activity budgets of captive animals are as similar as possible to their wild counterparts. However in practice this has rarely been achieved. We compared activity budgets among three groups of chimpanzees; wild chimpanzees in Bossou (Guinea, N=10), captive chimpanzees who participate in cognitive experiments (participant chimpanzees, N=6), and those who don’t participate in the experiments (non-participant chimpanzees, N=6) at Primate Research Institute (Kyoto University). Data from captivity were obtained from both experimental days (weekdays) and non-experimental days (weekends). In both wild and captive situations, the first author collected data using focal animal sampling and recorded behaviours every one minute. The results show that during weekdays, feeding and resting times of participant chimpanzees were almost the same as wild chimpanzees, whereas those of non-participant chimpanzees were significantly different. In contrast, during weekends, feeding and resting times of both groups of captive chimpanzees were significantly different from wild chimpanzees. These results suggest that cognitive experiments work as an efficient tool for feeding enrichment. Primates including humans share the manual skill for sophisticated object manipulation. Objectmanipulation tasks conducted in a face-to-face situation were applied to both chimpanzees and humans as a comparative scale of cognitive development. Blocks of different shapes were given to chimpanzees to test their physical understanding in a stacking-block context. The subjects were required to selectively use the appropriate orientation to stack up blocks efficiently. The performance in chimpanzees was comparable to that in humans of 2-3 years of age. The nestingcup task illuminated the fundamental similarity between chimpanzees and humans in making a hierarchical combination among multiple objects. Analysis on object manipulation can also be expanded to studies of wild chimpanzees. The behavior of chimpanzees in Bossou was analyzed in terms of different levels of complexity and efficiency. In sum, cognitive development in captive and wild chimpanzees was examined nonverbally by focusing on the patterns of their object manipulation. Understanding how and why tool-use emerged in primates has been a persisting goal of archaeology and anthropology. From the archaeological record, stone tool technology is thought to be at least 2.6 million years old. Features of knapped stones have allowed archaeologists to discriminate between different lithic artefacts, i.e. intentionally modified stones. However, it has not been possible to directly associate the earliest tool-user in the human lineage with the Oldowan technology, as the oldest tools are not directly associated with fossils. Lithic industries were described as a continuum, progressing from the most simple to the most complex. However, the discovery and identification of hominin species that are thought to exploit different ecological niches simultaneously, suggests that Homo habilis may have lost the title of “the first tool-maker”. Integration of these data and the evolution of lithic technologies has yet to be done. In this paper, we present data on chimpanzee nut-cracking at Bossou, Guinea, West Africa, and use non-human primate models to ascertain if older pounding tool industries might be unrecognised in the archaeological record. We present an overview of primate archaeology, focusing on the emergence of tool-use, a behavioural complex that dramatically increases the efficiency of food processing, and probably played a crucial role as an evolutionary selective force. Raw material-selectivity, discrimination of tool function, emergence of possessiveness, and preferential re-use of the same tool elements may have facilitated the first incidental knapping episodes. Elementary technology denotes the knowledgeable use of one or more physical objects as a means to achieve an end. Today we know little about the effects of ecological conditions on the use of elementary technology. The question that presents itself is essential to the understanding of the evolution of material culture: How does the environment affect the use of elementary technology? The aim of my Ph.D. research is to characterize the environmental factors that influence the use of elementary technology in foraging and in shelter construction (i.e. nestbuilding) among unhabituated chimpanzees (Pan troglodytes verus) in the Nimba Mountains, Guinea, West Africa. The following questions are addressed: 1) Which forms of elementary technology in foraging are present in the Nimba chimpanzees (e.g. nut cracking, termite fishing, ant dipping) and do they vary seasonally? 2) Is the use of elementary technology in foraging related to the temporal or spatial availability of target species (e.g. nuts, termites, ants) or appropriate tool materials? 3) Is the use of elementary technology in foraging related to the temporal or spatial availability of other food sources (e.g. fruit)? In addition, I address the question: what is the function of nest-building, both in trees and on the ground? The ecological-constraints model can be used to test assumptions related to how animals modify their socio-ecology to environmental changes and predicts that when within group feeding competition is high (i.e. when habitat-wide food availability is low) groups should split into smaller sub-groups to reduce ranging costs. Chimpanzees (Pan troglodytes verus) inhabiting a forest-farm mosaic at Bossou, Republic of Guinea, did not adapt their party size to changes in wild fruit abundance. Instead other factors such as presence of a maximally swollen female and consortship behaviour in combination with cultivated resource consumption were important determinants of party size. Chimpanzees at Bossou actually moved more when wild fruits were abundant but both sexes adapted their activity budgets in different ways to integrate guarded crops into their broader ecological strategy. Although it is probable that the Bossou chimpanzee community is characterized by a reduced degree of fission-fusion dynamics than other communities due to its small size, these results also emphasise that short-term changes in party sizes and activity budgets can be at least partly attributed to a specific set of environment and social conditions, including those associated with proximity of the village and high levels of exposure to local people. With species being increasingly forced into anthropogenically impacted habitats, access to energy-rich crops must be incorporated into models that are traditionally used to explain fission-fusion dynamics and other socio-ecological adaptations to more natural environments. We studied the effects of annual differences in nut-fruiting in four nut-producing tree species on the foraging success of adult female Japanese macaques through intra-group contest-type competition on Kinkazan Island, northern Japan. Among the four tree species, only T. nucifera nut fruited in 2004, while the nuts of all species, especially F. crenata nut, fruited in 2005. The Torreya trees were less abundant and small-sized, while Fagus crenata trees were more abundant and large-sized. We therefore expected that intra-troop contest-type competition among female macaques would be more severe in 2004 than 2005. As we expected, antagonistic behavior occurred more frequently in 2004. Furthermore, in 2004 high ranking macaques obtained a greater daily metabolizable energy intake, while the low ranking macaques could not fulfill their energy requirement by nut feeding alone. In 2005, in contrast, energy intakes of all female macaques from nut species exceeded their energy requirements and inter-rank differences in foraging behavior were not found. Thus, inter-annual difference in energy production and the distribution of the main foods affected their foraging success. This would consequently affect population parameters like survival rate and birth rate through intra-group contest-type competition. The extent to which wild chimpanzees truly exhibit altruistic behaviours is often debated, for example through analyses of food sharing and cooperative engagements. However the fitness costs to the donor are often difficult to quantify except through analyses of long-term reproductive success. Here we present data on one case of an adult female chimpanzee at Tai National Park in Cote d’Ivoire simultaneously nursing and transporting two male infants, one her biological son and the other an adopted infant. Genetic analyses confirmed that the adult female was not the mother of the adopted infant and the adopted infant exhibited behavioural traits commonly seen in orphan chimpanzees; he was more independent with regards to feeding and travelling but engaged in more resting and less play behaviour than the other infant. Although adoption is known to occur in both wild and captive chimpanzees, this is the first report of spontaneous and complete adoption of a dependant infant that includes breast feeding by the adopted mother. Given the direct fitness costs for the adopter (and presumably to the biological son) and the survival benefits for the adoptee, we explore the possible reasons for this behaviour. Fifty years of wild chimpanzee tool use: where do we stand? In 1960, Jane Goodall reported the first habitual use of tools by wild chimpanzees (Pan troglodytes), thus opening up the field of primate elementary technology. Since then, there have been many advances, both empirical and practical, reviewed here for the last five years. Following an anthropology analogy, studies of chimpanzee technology have gone through stages of natural history, ethnography, and ethnology. At least 8 field sites offer fully-habituated subjects. Results from these sites (and others) show chimpanzees to be unique in their material culture, amongst all living non-human species. Neither capuchin monkeys nor corvids, nor any other great ape species, present such a range of technological complexity. Analyses now go beyond simple presence/absence of tool use/making. Areas of special interest are: tool kit, tool set, tool composite, compound tool, technology without tools, and primate archaeology. New forms of tool use continue to be discovered, and known forms continue to be refined. Despite claims to the contrary, studies of living apes, especially the chimpanzee, provide the best models for understanding the evolutionary origins of human technology, through collaboration between primatologists and palaeo-anthropologists. Human eyes have a widely exposed white sclera surrounding the darker colored iris, making it easy to discern the direction in which they are looking. We compared the external morphology of primate eyes in nearly half of all primate species, and show that this feature is uniquely human. In addition, humans have the largest ratio of exposed sclera in the eye outline, which itself is most elongated horizontally. We suggest that these two features are adaptations to extend the visual field by allowing greater eye movement, especially in the horizontal direction. Comparison of eye coloration and facial coloration around the eye suggested that the dark coloration of exposed sclera of nonhuman primates is an adaptation to camouflage the gaze direction against other individuals and/or predators, and that the white sclera of the human eye is an adaptation to enhance the gaze signal. We will also discuss implications of facial morphology in visual communication by comparing developmental changes and sexual differences of facial morphology in great apes. We introduce a novel approach to comparative cognition studies ―a comparative eye-tracking study in chimpanzees and humans. Eye-tracking methodology enables us to compare the eye movements of two species directly (i.e. both qualitatively and quantitatively). Firstly, we show the striking similarities in eye movements between chimpanzees and humans when viewing photographs. Both species freely viewed the same sets of photographs depicting bodies and faces under the same experimental conditions. The similarities between the species were pronounced in terms of how they view faces. Secondly, we focus on the general differences in eye movements between chimpanzees and humans by presenting various scenes (i.e. both social and non-social scenes). Previous studies of humans showed that different eye movement patterns play different roles in semantic processing. In this study, humans exhibited longer durations of fixation on average and spent more time viewing objects/faces in peripheral vision compared to chimpanzees. We interpret these results in terms of species-specific strategies in eye movement/information processing. According to observations of wild and captive chimpanzees (Pan troglodytes), individuals seem to be able to recognize an object that is partially hidden by obstacles (e.g. tree branches). Such competence should be related with the ability to convert local fragmented visual features into a complete image. However, some studies report that chimpanzees often show difficulty when trying to convert these partial visual features. This study reexamined the ability to integrate partial elements into a whole image, using four chimpanzees and eight humans, as subjects. A line drawing that represents an object was moved behind a slit (6, 18, or 30 pixels in width) at either a slow or fast speed, followed by three line drawings presented on a monitor screen. One of the three drawings was identical to a drawing that previously moved behind the slit. The task was to choose this same drawing amongst the three alternatives. Results indicated that humans had high accuracy in all speeds and in all slit-width conditions. In contrast, with chimpanzees, the rate of correct responses decreased during the high speed or the narrowest slit conditions. These findings suggest that chimpanzees are able to recognize an object by converting a fragment into a complete image, but their ability to do so is quantitatively different from humans. background sounds that were either high-pitched or low-pitched. Chimpanzees made more mistakes when the background sound was synaesthetically incongruent (low-pitched for white, high-pitched for black) than when it was synaesthetically congruent (high-pitched for white, lowpitched for black). In humans, the effect was evident through increased latencies in incongruent trials in line with previous research. These results suggest that such cross-modal correspondence is shared in these two species and such cross-modal associations reflect evolutionary old mechanisms in the primate brain. Humans perceive an event that they cause differently from other events that occur in their environment. Such unique experiences, accompanied by our voluntary actions, are called the sense of self-agency and allow us to establish the concept of self as being an independent agent. Here, we studied how chimpanzees (Pan troglodytes), our evolutionary closest neighbors, perceive the effect of own voluntary action and compared with that of humans. We developed a task to conduct a comparative study between species. In the experiment, two cursors were shown on a computer monitor, one of which was the distractor cursor moved by the computer and the other was the self-cursor controlled by the participant using the trackball. The participants were required to detect the self-cursor. We found that chimpanzees have the cognitive capacity to correctly identify the cursor which they could control based on the spatial and temporal congruence between one’s own action and its effect. We also found chimpanzees were more dependent on the goal of action rather than kinematic motion for the self-other distinction and suggest some discontinuities between humans and chimpanzees in the perception of self-agency. They bring the food, but do they know how? Great apes are known to be flexible tool users, but causal knowledge should not be assumed: individuals might be responding to perceptual cues instead. Corvids have also shown complex tool use. Whether this similarity in behavior reflects the use of similar cognitive mechanisms is another question that remains to be answered. We used a strip-pulling paradigm where subjects had to choose between two strips, one holding a reward. First, we presented members of the 4 non-human great ape species with both a classical strip-pulling task (causal task) and another perceptually similar task that lacked the causal relation among its elements (perceptual task). Apes solved the causal but not the perceptual task. Second, we presented the same problem to two corvid species, the Common raven (Corvus corax) and the Carrion crow (Corvus corone). Corvids only solved the easier patterns of the causal task. Finally, we presented a similar task to Orangutans (Pongo pygmaeus), Chimpanzees (Pan troglodytes) and 2, 3 and 4 year-old children (Homo sapiens). All species solved the causal task, but only 4 year-olds solved the perceptual task. Our results do not support the perceptual hypothesis and show different knowledge of strippulling tasks in great apes and corvids. When a horizontal row of shapes presented in the window is shifted laterally, we humans perceive apparent motion with either the leftward or the rightward direction. This ambiguous direction becomes unambiguous if the shape itself has an “intrinsic” direction: we perceive these directional shapes move “forward”. This implies that some kind of “knowledge” established through the daily experiences affect the perceptual judgments in humans. If our closest neighbor, chimpanzees, exhibited similar kind of perceptual biases for forward-facing motion, we can use this bias as a tool for probing their knowledge in the various domain. In the current study, two young chimpanzees judged the direction of 2-frame motion display (apparent motion) of the directional triangles, photographs of chimpanzee quadrupedal walking, 3/4-view faces of chimpanzees and humans, etc. For non-biological but directional stimuli (triangle), chimpanzees exhibited no bias for the “forward” facing motion. Chimpanzee walking and 3/4-view faces, however, caused very clear perceptual bias for forward facing motion. Furthermore, additional experiment showed that this was not simply the discrimination of stimulus direction itself; forward-facing bias disappeared when the apparent motion was not presented. These results imply that chimpanzees also show the perceptual bias for forward-facing motions, but the effect was limited to biological agents. They may recognize which is “forward” of the chimpanzee body and expect chimpanzee moves the direction to which the head is orienting. Personality, or individual differences in behaviour and underlying psychology, has rapidly become an active field of behavioural, psychological and evolutionary research. Animal personality research can be divided into ‘psychological’ and ‘biological’ approaches, each employing a different set of questions and methods. Chimpanzee personality has mostly been studied with the psychological approach, which utilises a theoretical framework, trait selection process and evaluation methods used in human personality research. This work has described chimpanzee personality structure as largely similar to that of humans. However, we know little of chimpanzee personality at the behavioural level. I study personality of captive chimpanzees employing the biological approach. The candidate personality traits are selected from a range of naturally occurring behaviours in ecologically meaningful categories. Preliminary results show that behavioural traits are sufficiently repeatable, informative of chimpanzee personality structure and useful in investigations of personality’s influence on individual fitness. The results will inform of key personality traits in chimpanzees at the behavioural level and of their structural organisation, both of which are relevant for understanding the foundations of personality. I discuss my research in the theoretical framework of integrating the behavioural and psychological approaches to animal personality. In the current study, we modified a traditional computerized Match-to-Sample (MTS) paradigm such that two chimpanzees could participate in a single task, providing us with a novel window onto socio-cognitive processes. In our task, input from both subjects was necessary to complete MTS tasks, with one subject (the model) performing the first half of the trial, and the other (the observer) completing the trial using the model's actions as discriminative cues. Subjects took turns being models and observers, and were given a series of both symbolic and non-symbolic MTS tasks. Performance on social matching tasks was compared to that attained by the same subjects on identical MTS tasks but without the social element (i.e. performed individually). We found that both subjects were able to use the cues provided by a conspecific model to complete non-symbolic MTS tasks, and one of the two subjects, named Ai, was able to complete symbolic MTS while using the model's touch cue to determine the sample's identity. Ai displayed a significant decrease in performance when required to combine social cueing and symbolic representation processes. Our study establishes a novel paradigm for examining social interactions and social learning within a highly controlled and automated setting. For animals living in highly social communities, reading information of others and conveying information to others are very important communicative skills. Here I introduce two experiments concerning referential communication by chimpanzees. Using an eye tracking technique, the first experiment shows that static images of a conspecific’s actions modulate chimpanzees looking behaviors more effectively than those of an allospecific’s actions, whereas humans are readily sensitive to social cues of both species. In addition to this, increased first looking duration to a conspecific’s face suggests that chimpanzees extract more information from conspecific faces than those of allospecifics. In the second experiment, we used a natural feeding situation and found that chimpanzees changed their begging gestures more flexibly when they begged for food directly held by a human experimenter but such flexibility disappeared when they begged for food placed on a table. These results suggest that chimpanzees are better able to understand others’ actions than humans, and the need for chimpanzees to convey their desires referentially affects the flexibility of their gestures. Moreover, previous studies that test social cognition in nonhuman primates using human stimuli might have underestimated their abilities. Comparative cognitive studies on three primate species are being conducted at the Kyoto City Zoo. All experiments are open to visitors. The subjects include four chimpanzees, a pair of gibbons, and a family of four mandrills. All individuals were previously naive to cognitive testing. The task used involves serial learning using Arabic numerals. Each experiment with the gibbons or the mandrills took place in the outdoor compound. An experimenter located on the other side of the wire fence presented the subjects with a touch-sensitive monitor. Experiments with chimpanzees were held in an experimental booth adjacent to the indoor compound of the chimpanzees. Two sets of touch-sensitive monitors, computers, and universal feeders were installed in the booth. None of the subjects were isolated or separated during the experiment, and therefore, all had equal opportunity to touch the screen and initiate the task. While all chimpanzees readily interacted with the touch-sensitive monitors, the gibbons and the mandrills needed prior training to touch the monitor. Currently, an adult male gibbon and two young mandrills participate in the task. Each subject is progressively learning to perform the task. This study reveals no significant differences in the learning rate and curve across the three species. A dream to establish a primate research program in Korea began when I met Jane Goodall and Tetsuro Matsuzawa more than a decade ago. Then I came to a 2002 international primatological conference in Inuyama and announced a quite audacious but rather uncertain plan for primate research in Korea. In the following years students from my lab were given opportunities to have valuable learning sessions at the PRI weeks at a time. I myself have also visited Max Planck Institute for Evolutionary Anthropology and Marc Hauser’s lab at Harvard University as well as the PRI to seek wider perspectives and advice. Based on these experiences we launched a field study of Javan gibbons at Gunung Halimun-Salak National Park, Indonesia, in 2007. We have successfully collected two-year data on foraging ecology and are now conducting field studies on acoustic communication and mating systems. In collaboration with Seoul Zoo, we are also in the process of setting up a PRI-style cognitive science laboratory. My Magpie Team which has been carrying out long-term ecological research (LTER) for over 13 years has also begun a series of cognition experiments. This talk will introduce the history and future plan for the study of animal cognition in Korea. From such a simple beginning endless possibilities most beautiful and most wonderful have been, and are being, evolved. Gibbons are arguably the least studied member of apes despite their wide distribution throughout Asia. In order to contribute to primatology as a newcomer and address pressing conservation issues, we chose the endangered Javan gibbon as our subject for long-term field research. We observed 3 habituated gibbon groups in the Gunung Halimun-Salak National Park, Indonesia, from June 2007 to March 2009, and collected behavioral and feeding data from April 2008 to March 2009. The gibbons were usually active from ~6:00-16:00 h and mean daily path length was 1180.5 m. Mean home range size was 36.6 ha, with a mean overlapping area of 3 ha. Fruits comprised 61.3% of the diet, while young leaves and flowers were 23.1% and 11.6%, respectively. However, fruit feeding time was unrelated to overall fruit abundance and gibbons showed preference among fruit species. Gibbon behavior differed when feeding on preferred and non-preferred fruits in terms of revisit frequency and pattern. The difference in feeding bout length between subsequent visits was significantly larger for preferred species, and bout length was longer in later visits for preferred but not non-preferred species. This suggests that gibbons organize their daily foraging schedule around preferred food sources. Humans are thought to be the only species capable of widespread cooperation with unrelated individuals. The purpose of this study was to determine if learned reciprocity facilitates cooperation in situations where cooperation normally breaks down in nonhuman primates: inequity aversion and among strangers. Twelve brown capuchin monkeys (Cebus apella) were tested to determine if they could learn the benefits of reciprocal exchange in a prosocial choice task. Capuchins did not develop contingent reciprocity in this task. Instead, mutualism led to an increase in prosocial behavior during reciprocal situations. Furthermore, capuchins overcame inequity aversion through reciprocity and demonstrated widespread cooperation with unfamiliar monkeys. These results demonstrate that (1) simple cognitive mechanisms can lead to increased cooperation and (2) cooperation outside the social group is not limited to humans. It has been suggested that only humans show cumulative culture, with successive generations building on earlier achievements. Here we present two studies which investigated chimpanzees’ capacity for cumulative culture. The first is the observation of a new tool-use behavior in a wild chimpanzee in Bossou, Guinea. At this site, ant-fishing in trees had never been observed in over 27 years, although ant-dipping on the ground is customary. In the first observation of ant-fishing, the chimpanzee employed wands of similar length to those used for ant-dipping. Two years later, his tools for ant-fishing were shorter and more suitable for the targeted ants. This suggests the chimpanzee generalized ant-fishing behavior on the ground to the trees, and adjusted his tools accordingly. The second is an experimental study showing that captive chimpanzees can learn a more efficient tool-use technique by observing a skilled conspecific. Chimpanzees changed their technique when drinking juice with a straw, from a dipping technique to a more efficient sucking technique, after social observation. These two studies indicate that chimpanzees have the ability to adopt a novel behavior based on their prior repertoire of tool-use skills, and that newly developed tool-use behaviors can diffuse to other members of a community. Evolutionary theory postulates that altruistic behavior evolved for the return-benefits it bears the performer. For return-benefits to play a motivational role, however, they need to be experienced by the organism. Motivational analyses should restrict themselves, therefore, to the altruistic impulse and its knowable consequences. Empathy is an ideal candidate mechanism to underlie so-called "directed altruism," i.e. altruism in response to another's pain, need, or distress. The possibility that animals have empathy and sympathy has received little systematic attention, however, due to an excessive fear of anthropomorphism and a taboo on animal emotions. Actual animal behavior, however, would lead one to agree with Charles Darwin that "Many animals certainly sympathize with each other's distress or danger." In my own work with monkeys and apes, I have found many cases of one individual coming to another's rescue in a fight, putting an arm around a previous victim of attack, or other emotional responses to the distress of others. Empathy has many levels, from basic perception-action mechanisms (probably related to mirror neurons) to ever greater cognitive elaborations that include perspective-taking. The basic forms probably exist in all mammals as they serve important survival functions for animals with vulnerable young. The higher forms of empathy require a sharp self-other distinction found only in humans over the age of two, and a few other large-brained species: apes, dolphins, and elephants. Perception of the emotional state of another automatically activates shared representations causing a matching emotional state in the observer. With increasing cognition, state-matching evolved into more complex forms, including concern for the other and perspective-taking. Empathy-induced altruism derives its strength from the emotional stake it offers the self in the other's welfare. The dynamics of the empathy mechanism agree with predictions from kin selection and reciprocal altruism theory. 18. Do Syrian hamsters flexibly use beacon and geometric cues in a spatial navigation task? Great Ape Research Institute, Hayashibara Biochemical Laboratories, Inc.